Have you ever had one of those mornings where you wanted oatmeal but you knew you’d be stuck in a car? Or maybe you couldn’t decide between oatmeal and a muffin? 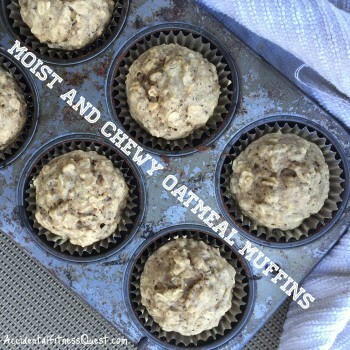 I have the perfect solution for you – oatmeal in muffin form! <Insert sweeping hand gesture here> Yes, I have perfected the muffmeal or maybe it’s the oatfin. OK, I’ll stop while I’m ahead and just call these chewy oatmeal muffins. They are soft, moist. Not dry and crumbly. The texture was out of this world and I was shocked. I’ve had “healthy” muffins before and you may as well just chew the box they came in. Not these babies. The fact that they’re portable and low in calories are nice bonuses. Preheat your oven to 350 degrees. Line a muffin tin with paper liners or spray with non-stick spray. Measure the dry ingredients into a bowl. Add the wet ingredients. Mix well to combine. Fill each muffin liner about 2/3rds full. Bake at 350 degrees for 20 minutes. Remove from oven and cool. Makes 11 muffins at approximately 156 calories each – 3g protein, 27g carbs, and 4g fat. I couldn’t quite squeeze out a dozen from the batter although I did try. Maybe next time I’ll try a little more oatmeal to see if I can get that last one, but I’m afraid to upset the delicate balance in texture, LOL. I used the regular old fashioned oats and not the quick cooking kind here, but I don’t see why the quick ones wouldn’t work. If you try them, please report back. You could get really creative with these and add in berries, chocolate chips, dried fruit, nuts, coconut and all kinds of flavors to amp up the breakfast-ness of them. I plan to smear mine with peanut butter in the morning… If they last that long.